Type: BOOKS. Detail: Fietz et al. Product Code: 9783981334807. The Chess Olympiad held in Dresden 2008 was a spectacular gathering of the world's chess nations with a lineup of 1270 registered players representing 146 teams in the 'open' tournament and 111 teams in the women's event. 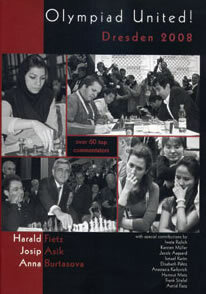 Fighting for the honour of their respective countries as well as for their own personal reputations, competitors from all over the globe were more determined than ever to play the best chess of their lives.This book not only presents the most interesting games and other chess highlights of the 38 th Chess Olympiad but also includes interviews and behindthescenes chat from players, coaches and observers alike. Among the contributors to this souvenir volume are those who had themselves been playing for gold medals on the stage in front of large crowds of spectators and others who could be proud of their individual achievements or whose teams performed above expectations.These players not only comment on the action at the board but also reveal their private prematch preparation and postmortem analysis.In Dresden, there were winners and losers, joy and heartbreak and no shortage of excitement and drama. But every participant from every country, large or small, as well as presidents, officials, organisers, arbiters, captains, volunteers, journalists, photographers and sponsors could not help but experience that same feeling of Olympiad United!So here, for your entertainment and instruction, over 60 chess experts from 31 countries tell the Dresden story as it has never been told before, and further illustrate the Olympic zeal in the form of over 100 annotated games and over 300 atmospheric classic black and white photographs. A collector's item.